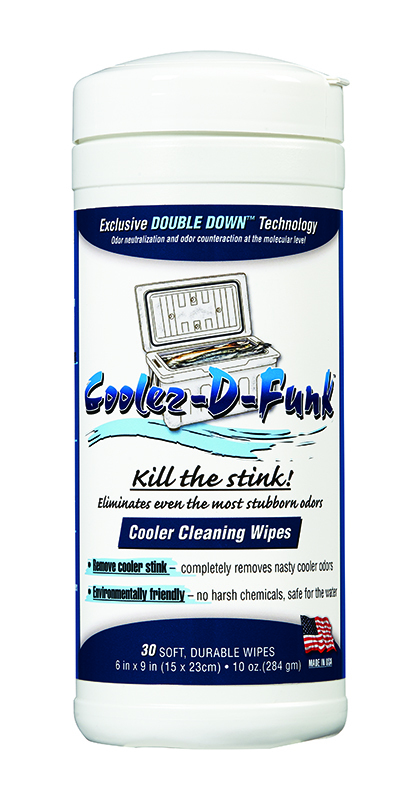 Cooler-D-Funk kills even the foulest cooler odors! There is nothing fun about a cooler full of meat blood, fish slime, spilled milk or leaky leftovers. Cleaning it up is one thing. Stopping the stink is something else altogether. Especially if it has had time to spoil. Cooler-D-Funk is up to the task! The secret behind Cooler-D-Funk’s amazing ability to counteract stubborn odors is Double Down Technology which both neutralizes AND counteracts odor at the molecular level. Cooler-D-Funk is not only remarkably effective, it’s also environmentally safe. It’s bleach-free and contains no harsh chemicals. In fact, you can use Cooler-D-Funk in your boat, on your dock or at the cabin without concern. And, it rinses clean with no residue..